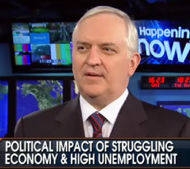 Paul Gigot from The Wall Street Journal joins Fox News to discuss the state of our economy and who exactly is to blame. The Democrats are notorious for pinning all the blame on Bush, but after 19 months of Obama's presidency, it's time he accept some of the blame. Obama's policies have passed, and the country continues to go deeper and deeper into debt. In 2007, the deficit was $161 billion, while the 2011 projected deficit is $1.3 trillion.